The Scientific Committee on Antarctic Research (SCAR) is the parent organisation of ASPeCt. The Tasmanian Partnership for Advanced Computing (TPAC) will will host the ASPeCt data archive from early 2006. The Climate and Cryosphere (CliC) program focuses on all regions of the cryosphere including ice sheets, ice shelves, glaciers, river and lake ice, permafrost and frozen ground, snow-covered regions, and sea ice. The Data and Information Service for CliC (DISC) is a meta data centre for cryospheric data and a useful source of other cryospheric information. 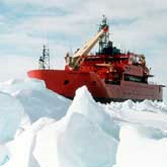 The International Antarctic Zone Program (iAnZone) focuses on the oceanography of the Southern Ocean, with particular emphasis on the sea ice zone. It has strong links to the goals and objectives of ASPeCt. The National Snow and Ice Data Center (NSIDC): "All About Sea Ice". The International Project on Antarctic Buoys (IPAB).